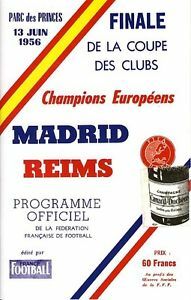 REAL MADRID made their international reputation in the first five years of the European Cup, in fact the club were firm advocates for its introduction. Since 1955-56, Real have rightly been indelibly linked with the premier football club competition. The idea of a pan-European tournament had first been mooted in the 1920s, but the lack of infrastructure to support such a venture was a hurdle. While some countries were technologically advanced, many did not have the mass industrialisation of Britain or Germany. As the 1920s became the 1930s, and Europe recovered from depression, nationalism – perhaps born out of protectionism – swept across the region. The Mitropa Cup was introduced in 1927, involving – as the name suggests – countries from central Europe. This, no doubt, contributed to the advanced state of football in Austria, Czechoslavakia and Hungary during this period. If the European Cup had been formulated during this era, it is likely it would have been won by a team like Rapid Vienna, Ferencvaros or Sparta Prague. In the aftermath of the second world war, sport was seen as a unifying agent as much as it was an expression of nationalist vigour. While the Mitropa never scaled the heights it achieved in the 1920s and 1930s, it returned and also pointed the way for other competitions. More than any other, the modest but highly successful Latin Cup showed what could be achieved. This involved the top clubs from France, Italy, Portugal and Spain. It was no coincidence that when the European Cup finally emerged in 1955, clubs from these nations set the pace. Real Madrid were not Spain’s most successful club before the 1950s. After the war, Real were in decline, finishing as low as 11th in La Liga. At the same time, Spain had become somewhat isolated, with many countries breaking off diplomatic relations. Under Franco, Spain was not a member of the United Nations and had pursued a strategy of economic self-sufficiency with no foreign trade or investment. By the early 1950s, it was clear that Franco’s policies had failed and Spain’s economy was on the verge of collapse. Franco started to liberalise the financial system and promote tourism, in what many observers called “The Spanish Miracle”. Spain, in the 1960s, enjoyed prosperity, boosted by the growing urbanisation of the population and a massive influx of holiday-makers. Real Madrid’s own renaissance preceded this rebirth, but gathered momentum as Spain sought to become integrated with the international community once more. The club’s success in the late 1950s owed much to the influx of top-level overseas talent and a strategy of “a star a year.” Of the 36 players appearing in their first five European finals, eight were foreign. Santiago Bernabéu, the club’s president, pursued and secured the Argentinian Alfredo Di Stefano in 1953, signing him from Colombian side Millonarios, the club outlawed by FIFA for signing international players without authority. He also signed, on the advice of Di Stéfano, Héctor Rial, another Argentinian who had played in his home country, Colombia and Uruguay. Di Stéfano wanted his friend to join him in Madrid not just for company but to bring someone to the team that could help build attacks. Players like Di Stéfano and Rial brought a Latin American swagger to the club, making Real a wonderful spectacle when they were in full flight. Bernabéu was among the first football impresarios to recognise the economic potential of the sport and built a huge stadium that would eventually bear his name. In the 1940s, Real’s home held just 16,000 but Bernabéu had plans to develop a ground to host up to 200,000 people. There were just 16 teams in the 1955-56 competition with no representative from England as Chelsea were advised not to enter by the Football Association. In their place came Poland’s Gwardia Warsaw, whose claim to fame was their 1954 Polish Cup win. Of the 16, only seven had been champions in their respective leagues in 1954-55. Real began their first European Cup campaign with a 2-0 win in Geneva, beating Servette, who had finished sixth in the Swiss league in 1955. Miguel Mûnoz, who would later become manager of the club, scored the first ever Real goal in the competition, 16 minutes from time. The ease by which Real disposed of the Swiss team (5-0 in the second leg), suggested the Spanish giants would be one of the favourites. In the quarter-final, they faced Partizan of Belgrade, beating them 4-0 in front of 106,000 people on Christmas Day before losing 3-0 in an intimidating second leg. While Real were enjoying their European sojourn, but they were far from invincible in domestic football. They were champions in 1955, but they would relinquish their crown to Bilbao by a 10-point margin. Spanish teams, however, were fitter and faster than most of their European peers. When Real were drawn to meet AC Milan in the semi-final, it was arguably the first great European Cup clash. Milan had the Swedish duo Gunnar Nordahl and Nils Liedholm and the Uruguayan-turned-Italian Juan Schiaffino in their line-up. Real won 4-2 in Madrid before 129,690 spectators – the European Cup had truly arrived. Although Milan won the second leg 2-1, Real had done enough in the first meeting to earn a place in the final against France’s Stade de Reims. The French champions had some top talent in the form of midfielders Raymond Kopa and Michel Hidalgo. Playing in their own country at Paris’s Parc des Princes, Reims went 2-0 ahead thanks to goals from Michel Leblond and Jean Templin. Real bounced back with their all-out attacking style and goals from Di Stéfano and Rial brought some order, before Hidalgo restored Reims’ lead. Marquitos made it 3-3 when he ran upfield, exchanged passes with Rial and Di Stéfano and then found himself in the area to take advantage of a rebound off Templin. With 11 minutes to go, Rial scored again – 4-3 to Real Madrid. In beating Reims, and before that the mighty Milan, Real Madrid set a new benchmark for the modern game. Santiago Bernabéu got what he yearned for, a team playing exciting football that could eclipse all others. The team’s coach was 36 year-old Jose Villalongo Llorente, the youngest manager to win the European Cup and a former volunteer from the Spanish Civil War. 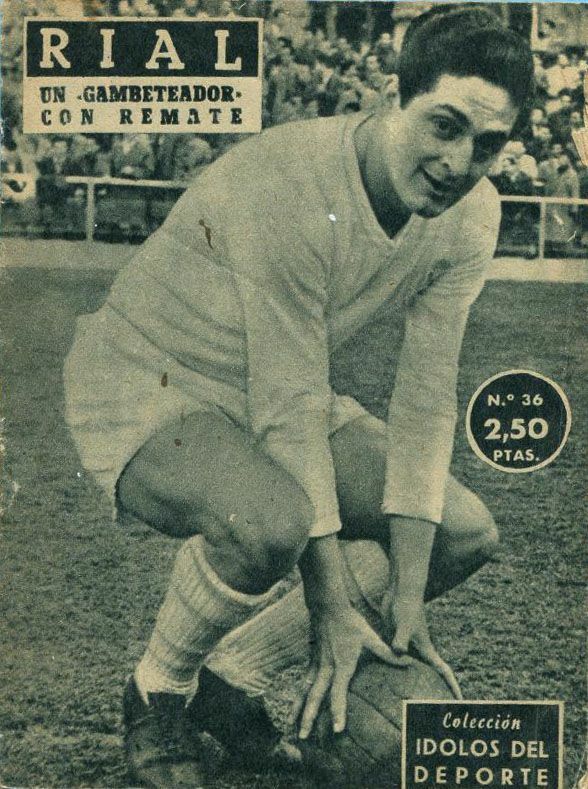 Every member of Real’s triumphant team, with the exception of future artist Ángel Atienza, was either a current or future international, mostly with Spain. Although Bernabéu’s philosophy was to bring top stars to the club, there were a number of home-grown players in the squad, such as the tough tackling José María Zárraga and inside forward Ramón Marsal Ribó. Goalkeeper Juan Alonso was an acrobatic last line of defence who won the prestigious Ricardo Zamora trophy in 1955, the award for the custodian with the lowest goals-to-games ratio. Central defender Marcos Alonso Imaz, known as Marquitos, was signed from Racing Santander and was pivotal in Real’s success in the early years of the European Cup. His grandson currently plays for Chelsea. 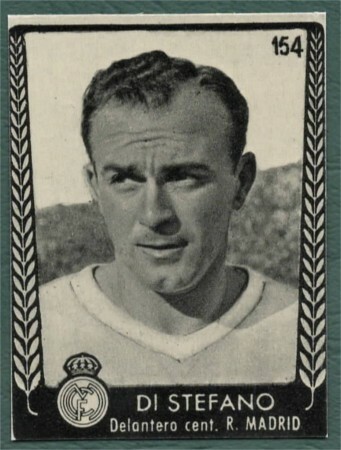 Di Stéfano was the headline maker, a strong and powerful centre forward and one of the most influential players in the game. He was not only the “leader”, his organisational skills made him the architect of what became modern professional football – the team ethic. On the flanks were Gento, a stocky winger with sublime technical skills who arrived from Santander, and Joseíto. While the flair and magic came from players like these, the engine of Real’s team was skipper Mûnoz, a commanding presence on the pitch. Although Real were deserving champions, they also recognised they could not stand still or rest on their laurels. No sooner had they won the European Cup they signed Raymond Kopa from Reims. As holders, they qualified for the 1956-57 European Cup, where their legend would begin to really take shape. This was just the beginning of a golden age. The Real Madrid team that won the inaugural European Cup: Juan Alonso (28), Ángel Atienza (24), Rafael Lesmes (29), Marquitos (22), Miguel Mûnoz (33), José María Zárraga (25), Héctor Rial (27), Francisco Gento (22), Ramon Marsal Ribo (21), Alfredo Di Stéfano (29) and Joseíto (29).